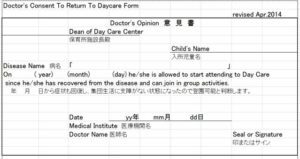 The purpose of this form is to enable a sick child to return to day care. A day care center is where infants and children spend a lot of time participating in group activities. The chart below lists diseases that the child’s doctor will provide observation on regarding the condition of his/her infectious disease. This is to help protect all the healthy children at the day care center to stay well and feel comfortable there. The doctor takes the contagious period into account and will let the child return to the day care center when he/she has fully recovered. Measles 9-12 days From 1 day before symptoms appear until 4 days after first appearance of rash. After being fever-free for 3 days. Influenza 1-3 days When symptoms are present, especially from 24 hours to 3 days after symptoms begin. At least 5 days after the appearance of symptoms, and not until he/she is fever-free for 3 days. Rubella (German measles) 2-3 weeks 7 days before and after evidence of rash. After rash has subsided. Varicella (Chickenpox) 2-3 weeks From 1-2 days before the rash appears until chickenpox blisters have formed scabs. After the rash becomes crusty and dry except on the soles of the feet and palms of the hands. Epidemic Parotitis (Mumps) 2-3 weeks From 3 days before symptoms appear until 4 days after the salivary glands behind the ears begin to swell. After swelling of the salivary glands behind the ears, under the jaw or under the tongue has been present for 5 days and the child’s physical condition is good. Tuberculosis (TB) When the disease is no longer contagious. Pharyngoconjunctival fever(pool fever)　Adenovirus 5-7 days For several days, with symptoms such as fever and red eyes. After being free of symptoms for 2 days. Pink Eye（Epidemic Keratoconjunctivitis） 4-7 days For several days, with symptoms such as red eyes and eye mucus. Once symptoms have subsided. Whooping cough 1-2 weeks For 3 weeks after they start coughing, unless they begin antibiotics. After coughing has subsided or after 5 full days of treatment with the appropriate antibiotics. Enterohemorrhagic E.coli infection (O157,O26,O111etc) 3-8 days When found not to be contagious.